New from KAMCO is the Scalebreaker C210 tank mounted descaling pump, for the chemical cleaning of calorifiers, boilers, plate heat exchangers and cooling circuits. 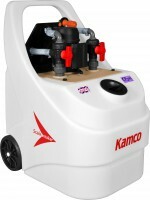 Kamco says the C210 is designed to increase safety by keeping descaling chemicals enclosed at all times within the tank, hoses or equipment being descaled, thus minimising fumes, splashes and consequent risks. The Scalebreaker C210 has a 125 litre tank with an integral vertically mounted, acid-resistant pump, and comes complete with flow and return hoses and a flow reversal device for faster descaling. The flow and return hoses have 1” BSP threaded couplings for easy connection. Flow rate of the C210 is up to 170 litres per minute, and this high circulation rate, and a 24 metre head, can give more effective descaling.